The natural beauty of the weeping branches and sprays of scaly foliage on a weeping Alaskan cedar (Chamaecyparis nootkatensis 'Pendula') makes pruning a rare task. Occasionally twig die-back or an errant branch warrants removal or the size and shape needs reducing. Avoid shearing this tree all over so that the elegant form is not destroyed. Examine the overall size, shape and form of the weeping tree. Note which areas of the tree warrant trimming or branch removal. Focus on maintaining the habit of the tree rather than on large-scale pruning. Rarely does this plant need pruning. Reduce twig tip length on branches by making a pruning cut one fourth of an inch above a green spray cluster of needles on the twig. Avoid cutting across needles. A close look at a branch reveals green-colored stems of the pendent foliage, whereas the twig is reddish brown. Always make the cut on the twig. Step back and look at the area just pruned. You should not be able to visually notice the pruning cut or an abrupt change in the graceful habit of the branch end. If you wish to shorten the branch further, repeat Step 2, cutting farther back, always preserving the weeping sprays of foliage. The types of cuts you make on your weeping Japanese maple are important. Proper cuts should be flush to the trunk and just outside of the branch collar. This will help your Japanese maple heal properly and limits the possibility of a disease infecting your tree. There are a couple of different ways to prune a weeping Japanese maple. First you must determine the style that you desire. Some people prefer to have a mounded style of weeping Japanese maple and some prefer to expose the branching and show off the twisting structure of the tree. The easiest weeping Japanese maple style is the mounded style. Prune the outer branches along the bottom to keep them off of the ground. Prune out any branches that branch straight up off of a weeping branch. Prune out any branches that don't fit the natural flow of the tree. You want your Japanese maple to look like a symmetrical waterfall. The exposed branch style is a little more difficult to create than the mounding style of Japanese maple but it is well worth the effort. If you decide to expose the branches on the Japanese maple, you should start by looking at your tree from all angles. Prune out any branches that cross over one another and any branches that branch straight up off of a weeping branch. You want to have the branches come off the side of the main branches. Prune out any branches that don't fit the natural flow of the tree. Establish a tree shape out of the natural shrub form by removing all branches and sucker growth on the bottom third to one-half of the weeping bottle brush tree's main trunks. Control the number of trunks by removing any undesired trunks when the tree is young and cutting down any weak, under-performing or damaged trunks on the mature plant. Inspect the canopy occasionally for broken, diseased or dying branches. Remove the damanged branches when you see them at any time of the year. Cut back to healthy wood or down to the parent branch just outside of the slightly swollen branch collar. Trim the lower canopy as needed for clearance or appearance with long blade scissors or mechanical shears held parallel with the bottom of the canopy. Make a clean, level cut around the tree. Decide on the height above the ground for your mushroom shaped weeping cherry. Measure the distance with a tape measure. Remove any dead wood or branches from the tree. Dead wood and branches stress the tree and have a negative impact on living wood. 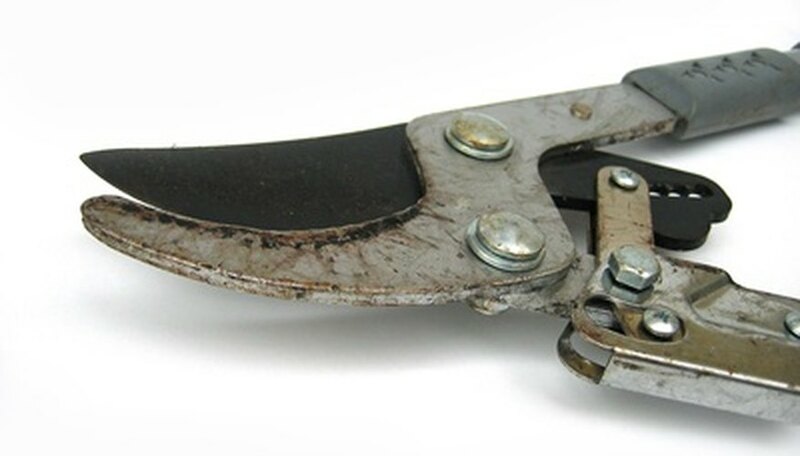 Use a pair of sharp pruning shears on branches the size of a pencil or smaller. Use a pruning saw on larger branches. Prune away any branches that cross. Crossing branches can rub against each other. That rubbing can damage the bark and create a disease vector. Trim your weeping branches to the desired height above ground by clipping them with a pair of sharp pruning shears just below a leaf or bud. Prune weeping mulberry in the dormant season, after the leaves have fallen off and there is no longer growth of any kind. Pruning it during the growing season can damage the tree. Identify the branches you no longer want growing. This may include entire branches or sections that sprouted off of other limbs. Cut unwanted branches at their beginning point. This may be where they meet the trunk of the weeping mulberry tree, or where they meet other limbs. Look for branches that are rubbing or crossing each other. Remove the ones that are wounded by placing the cut at the V-shaped connection it shares with another branch. Trim branches that are touching the ground. They can be shortened or cut all the way back to the trunk. Remove any dead, diseased or crossing branches at the trunk of the tree. Cut the branches off with a sharp set of shears that is large enough to fit over the entire branch. Thin the branches in Acacia salicina’s canopy to allow for a greater weeping effect and decease the trees resistance to the wind. Remove about ¼ of the branches. Remove each branch at a junction where it meets another branch. Brush each cut with pruning sealant.